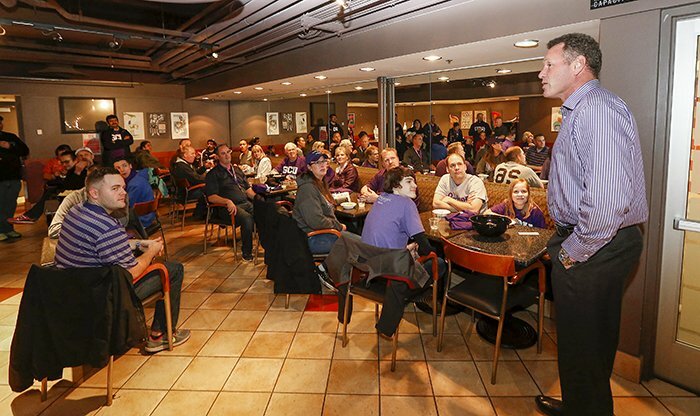 Men’s Basketball Coach Dan Majerle speaks at one of the popular Lopes on the Road events, which bring together alumni, students and employees at selected GCU away games. John Thornton is already making plans for the fourth season of Lopes on the Road — a chance for Grand Canyon University alumni, students, faculty and fans to cheer the Lopes to victory nationwide. 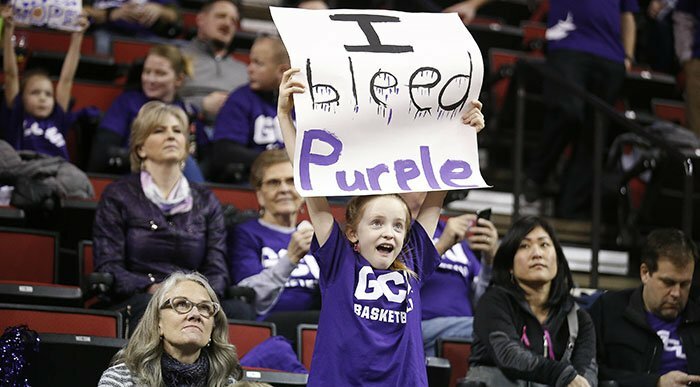 The Seattle resident, who is studying online for his doctoral degree at GCU, remembers his first Lopes on the Road experience — a year ago, when the men’s basketball team played at Seattle University, a 30-minute drive from his home. His online experience has made a GCU fan out of Thornton. “It’s to the point everybody I know gets a GCU pen from me,” he said. “My wife is even changing careers and went to GCU. My son is a high school senior, and he has just been accepted at GCU as a ground student.” Thornton and his family attended the game together, and it made him even more excited when he saw a couple hundred more Lopes in the crowd. 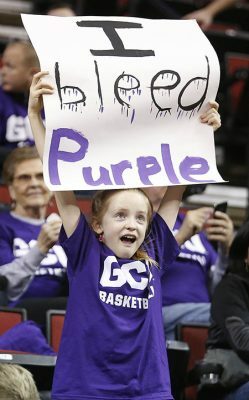 The Lopes on the Road events attract GCU fans of all sizes, but they have one thing in commmon — passion for a certain color. What started in 2015 with 86 participants has grown to 1,382, and GCU hopes to continue expanding Lopes on the Road. The joint venture, operated by GCU’s Department of Athletics and Office of Alumni Relations, has scheduled events in 11 cities for games featuring four of GCU’s teams — six games for men’s basketball and two games apiece for baseball, men’s soccer and women’s basketball. While Lopes on the Road provides a support system for athletes, it also creates a sense of camaraderie among alumni and nontraditional students. Mike Vaught, GCU’s Vice President of Athletics, said the Alumni Relations and Athletics departments aim to deliver the best experience at every city they visit by bringing GCU fans together with fellow Lopes, coaches and administrators. He said it’s even more important to consistently deliver the spirit and community of GCU to the fans and alumni. Although it is not unusual for cheering, screaming, GCU purple-clad fans to take up an entire section at the opposing team’s arena, Vaught said the atmosphere is inspiring because some fans will drive for hours to attend a game and then drive back home. GCU alum Erik Adams lives in Bakersfield, Calif., and said he did not know about the Lopes on the Road events when he met a GCU representative during his first Lopes men’s basketball game. “I was just getting ready to graduate and it was our first year in the probation period for the Lopes to transition from NCAA Division II to I, so I went to watch a game,” he said. Adams immediately decided to sign up to be part of Lopes on the Road. Liz Conwell, Alumni Relations Manager, said fans remain loyal and are a testament to GCU’s community-minded spirit. Conwell recalled being at one soccer game and seeing that, despite rain and freezing temperatures, 80 Lopes fans devotedly showed up while the opposing team had none. Vaught had his own special memory to share, too.